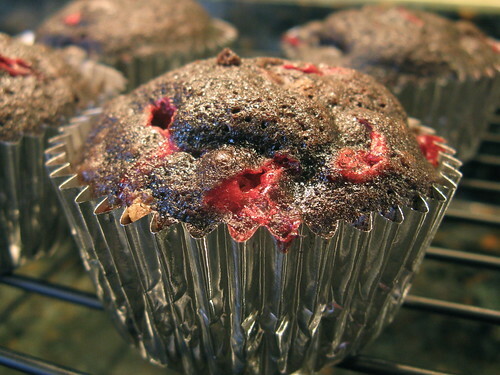 This month's Iron Cupcake Earth ingredient is Cranberry, how perfectly seasonal. I batted around a couple different flavor pairings when this one came to me. Its inspired by all the fancy espresso drinks that stores like Caribou & Starbucks have for the holidays. 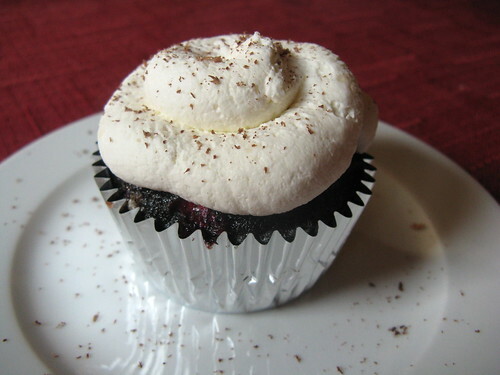 The cupcake is flavored with dark chocolate & espresso then studded with jewel like fresh cranberries. Whipped cream is of course the traditional topping for these coffee drinks so its the frosting on this cupcake. Then then whole thing is topped with a little grated bittersweet chocolate. I think this might be one of my favorite cupcakes I've made to date (maybe because I'm such a huge fan of mochas to start with). The cranberries give a nice tart note against the sweet mocha. Preheat oven to 350 F. Prepare muffin tins. Melt butter in a large heavy saucepan over moderately low heat, then whisk in cocoa. Mix the instant espresso into the hot water. Add this mixture into the saucepan and whisk until smooth. Remove from heat. Whisk in separately sugar, egg, buttermilk, and vanilla. Sift flour, baking soda, baking powder, and salt into the cocoa mixture and whisk until just combined (it will be a little bit lumpy). Roll the cranberries in a little flour to coat them. Gently mix the cranberries into the batter. Fill muffin tins to about 2/3 full. Bake for 18 - 20 minutes until a skewer or toothpick comes out clean. It's a moist cake, so don't worry if a few crumbs stick to your tester. The gelatin in this whipped cream makes it hold up to piping, just make sure it is completely melted so you don't get lumps. Whip the cream, sugar & vanilla together just until soft peaks form. Set aside. Mix the water & gelatin together in a small bowl and microwave briefly, about 10 seconds, until the gelatin is dissolved. Allow to cool slightly but not get hard. Add to cream & continue whipping until stiff peaks are formed. Keep in the refrigerator until ready to use. Makes enough to frost 5 cupcakes. Pipe frosting onto the cooled cupcakes & grate a little chocolate over the top. If you want to join the fun of Iron Cupcake Earth next month you can find all the information here plus links to all the fabulous corporate & Esty prize sponsors. Voting is open on Iron Cupcake - go here to vote. What great photos, the cupcake and the porcetta! never heard of these...glad I came by. these sound really tasty. I could easily be persuaded if you offered. Wow - those cupcakes are amazing. I was sceptical (not a buttercream fan)until I saw that it was a whipped cream frosting. Delicious! And the porchetta makes me want to get a crockpot. Kat, those look so yummy. I would have never thought to pair these together. I will have to make these! Realy festive. I have never used fresh cranberry in cakes. I'm not a mocha fan, but I love the look of those cranberries studded in the cupcake! Um- amazing. I've never actually had a coffee drink with cranberry in it but that's a great source for inspiration. The cupcakes look great and I love the whipped cream frosting.